Fruit Rockets is another addition to the classroom-favourite genre of multiplication and division practice. It looks and sounds very attractive and is built around an achievement system that encourages children to master times tables for use in both multiplication and division. As with many educational apps, if you strip away the stylish presentation, you are left with a multiple-choice quiz. A question is given and players must select one of the three possible answers. 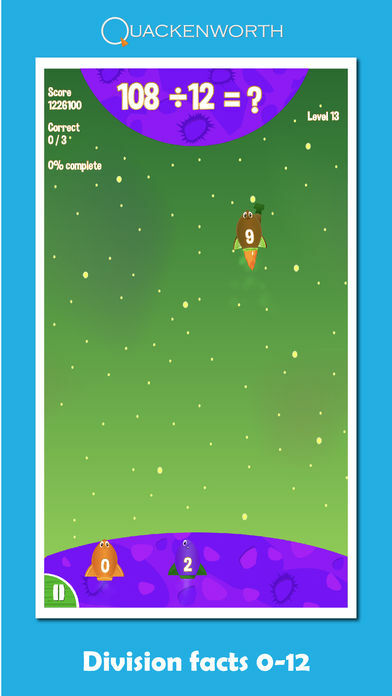 When the choice is made, by clicking on a Fruit Rocket, the rocket launches. It fails to hit its target if it is the wrong answer and the player can choose one of the remaining options. The penalty for being wrong is a loss in the points that can be earned - being correct first time nets the player 150 points, second time 100 points and, generously, 50 points for the final try. This all works very well and the stepping up through the levels is well judged. It starts off with very restricted questions and ends up going up to 12 x 12, which is the level to which most children are expected to develop fluency by their teachers. The feature that lifts this app up over many others is that it includes a setting that lets teachers make easier use of it in the classroom. There are so many maths practise apps that could prove to be excellent explanation aids for teachers if only things like timers and countdowns could be turned off. That is what Practice Mode does in Fruit Rocket. Practise mode is the same game but without any of the pressures. Multiplication or division can be chosen as can a difficulty level and then teachers can spend time talking it over with the class. Tips on how to tell if one number can be divided by another or how to discount numbers from a certain times table can be discussed by a teacher not trying to get to an answer within a certain time. Sadly, the app does not include the classroom-friendly option of either allowing multiple-users to save their progress or for a new player to easily reset the scores. Either of these features can really help an app be used more effectively in a typical classroom where there is not one device allocated to each child. Of course, this will not matter to parents looking for a practice app for their child and they can still make use of the practice mode to talk their children through any difficulties. There is something of the old style-arcade games in the presentation of fruit rocket. Over-the-top explosions, grandiose sound effects, and bonus scores appearing over the top of a scrolling starfield create this impression. The high-score based goals complete it. The gameplay cannot quite equal those games from which it takes this lead. It does, after all, have to hit some educational goals and get children practising quick multiplication and division skills, but the vibrant presentation makes the maths practise more fun. Most children can benefit from practising times tables and the more attractive the experience is made, the better. 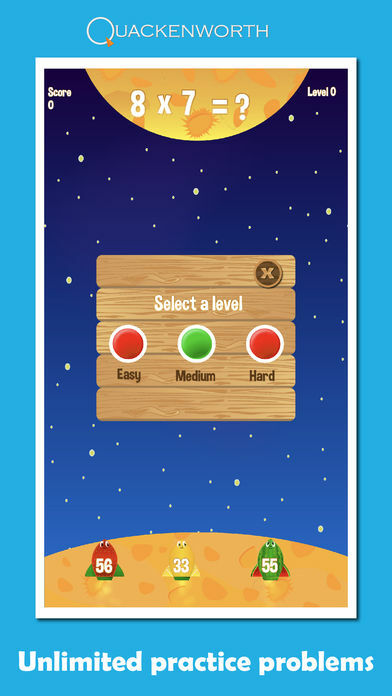 Whether for use in the classroom or at home, Fruit Rockets is a fine app to provide this repeated practise necessary to learn. 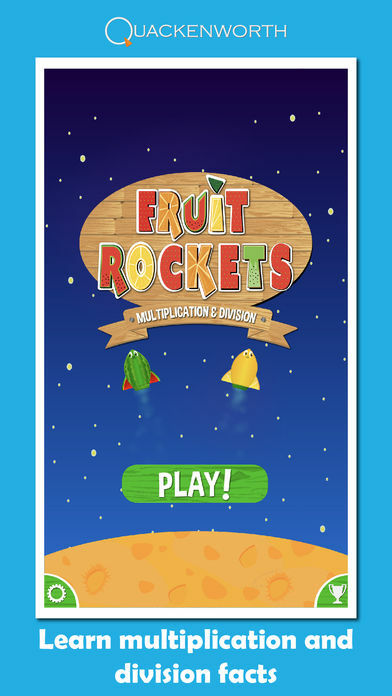 Fruit Rockets is a math game that makes learning Multiplication and Division facts fun and easy. It contains fun characters, engaging animations, and sound effects that keep kids coming back for more! The game has been proven to keep kids engaged in learning multiplication facts and will boost your child’s math confidence and test scores. • 40 combined multiplication and division levels, plus an unlimited number of practice problems. • Kids can practice each multiplication and division facts separately ( 2’s: 2 x 4, 2 x 5, 2 x 7, etc.) as well as practice randomly (random facts: 4 x 4, 2 x 9, 10 x 3, etc.). 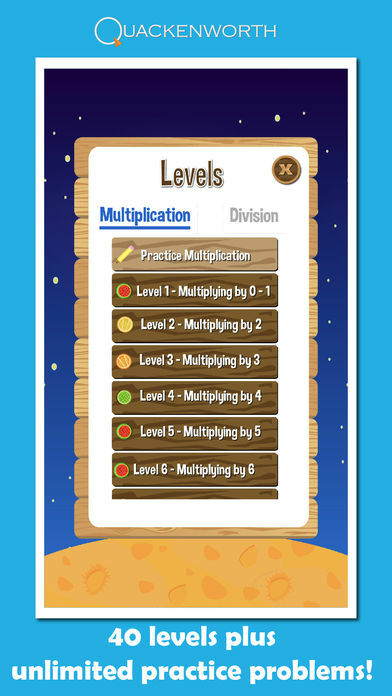 • MULTIPLICATION LEVEL - Multiplication section covers multiplication facts 0-12. • DIVISION LEVEL - Division section covers division facts 0-12. • PRACTICE SECTION - Practice section with an unlimited number of problems. Levels of difficulty include easy, medium, and hard. 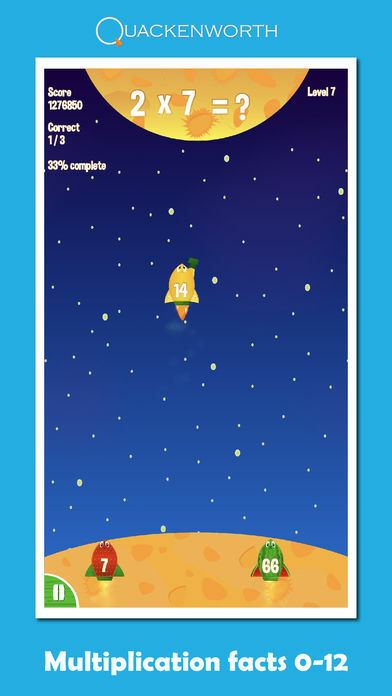 • AWARDS - Earn math awards as you progress through each level. • BONUS POINTS - Earn bonus points for special math accomplishments. • PASSING A LEVEL - Kids must get 80% of the problems correct to pass to the next level. • FREE WORKSHEETS – Fruit Rockets has FREE companion worksheets that can be downloaded from our website. They allow children to practice multiplication and division facts on over 75 worksheets. • Improves recognition of common multiplication and division facts. • Provides a strong foundation for more advanced elementary math. Quackenworth apps do not contain in-app purchases, third party advertising, tricks, or surprises. We take your privacy seriously and are honored to be a part of improving your child's skills! Enjoy!